One fan took 1,100 photos from his front-row seat of the procession. 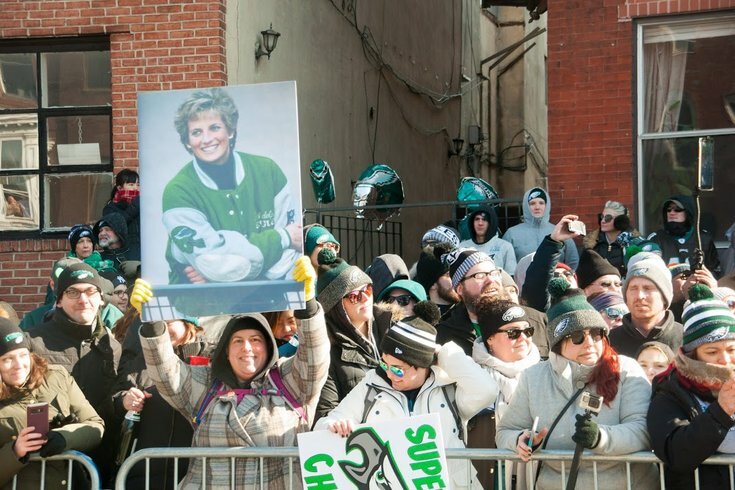 One of more than 1,000 photos taken by Philadelphia Eagles fan Brian Kravitz, who rode with security during the parade procession. The numbers are still rolling in from just how many people attending the record-breaking Philadelphia Eagles victory parade Thursday, but few had a view quite as amazing as fan Brian Kravitz. 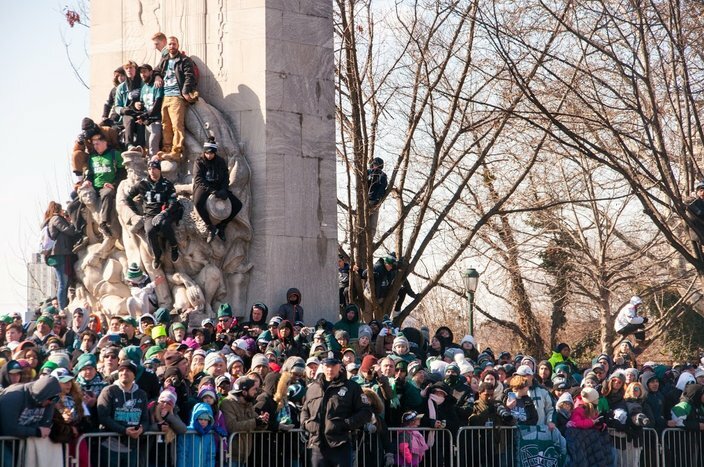 During the parade that marched from Lincoln Financial Field to the Art Museum steps, Kravitz got a front-row seat to the action -- and it's not because he was first behind the fence. 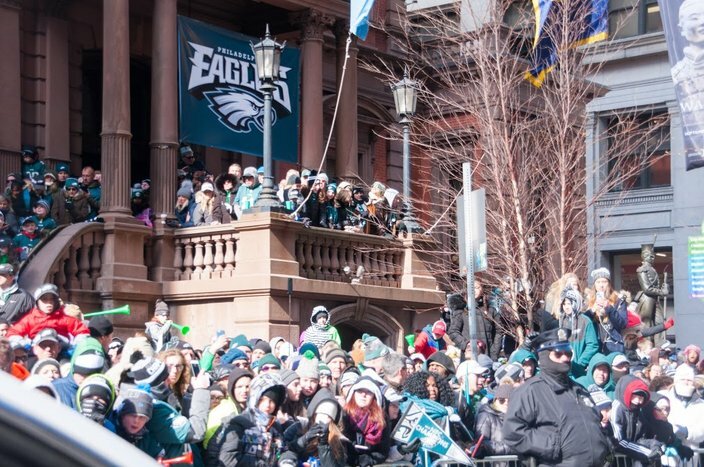 Along with his brother, a volunteer for the parade, Kravitz sat in the police car that led the security detail of the route, giving him a front-row view of both the parade and most of Philadelphia's most diehard Eagles fans. By the end of the event, Kravitz snapped 1,100 photos trying to capture the spirit of the day. “It was truly a once-in-a-lifetime experience being able to ride down Broad Street with millions of fans cheering the entire time,” Kravitz told PhillyVoice in an email. Now Kravitz has made those photos free and available to download on Reddit. He’s already received warm responses from people who found themselves in the photos. The snaps were arranged in chronological order so you might have a decent shot at finding yourself based on where you were standing during the parade. Kravitz said he tried as best he could to get pictures of fans on both sides of the street, as well as looking out for funny signs, wild costumes, and people hanging out of windows or balconies. One unexpected bonus of riding in the cop car was a chance to hear the police radio during the parade, which was particularly funny anytime a player got off the bus to interact with fans. “At one point the police captain called my brother to relay the message that the players must stay on the buses, because if they got off at the Parkway, the police couldn’t guarantee to contain the situation due to the level of excitement and enthusiasm of the fans." At the end of the procession, Kravitz had the chance to meet a few players and get autographs before the start of the ceremony, where he watched from the Art Museum steps with the press. “That whole day was one of the best experiences of my life,” he said. Check out all of Kravitz’s photos, and look for yourself in the full 1,100-pic collection, here.